Veggie, Flower, Herb Seeds Have Arrived! Who could be happier on a gray, 33°F February day than a gardener standing before just-assembled Burpee seed racks at a local store? Forget Pauxatauny Phil and his shadow. Burpee seeds are here—ready for you to buy! Spring is coming to a garden near you soon! Yes, seed racks for 2011 are ready for your perusal in many local stores. The snow crust on your lawn may encourage you to stay close to the glowing embers in your fireplace, but don’t linger too long. If you wait until April or May to buy, you may be disappointed at the selection remaining. I’ve been there, done that. I was pleasantly surprised at the size of the new Burpee display when I stopped by Wal-Mart this morning. I did a rough estimate: more than 400 pockets of seed packets; 60% veggies, about half organic; 25% flowers, both annual and perennial; 15% herbs, both annual and perennial. 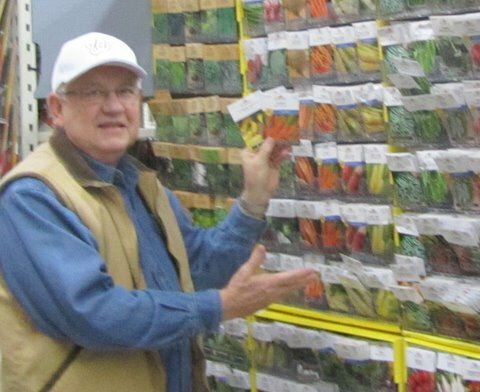 Being a tomato fanatic, I usually rate seed racks by the number of tomato varieties offered. The Burpee racks at this store offer: Baxter’s Bush Cherry, Beefsteak and Super Beefsteak, pink and red Brandywine, Cherokee Purple, Delicious, Lunch Mate, Polish Linguisa, Red Lightning, Roma, Snack Attack, Summer Salsa, Super Sweet 100, Yellow Pear, and two mixes—Best of Show and Rainbow Heirlooms. That’s nearly double the varieties offered last year. Price: about half the packets are $1.00 each, the other half $1.50, including most of the organic selections. Brandywine red tomato (organic), $1.50; Goldtender summer squash ($1.00); Short ‘n Sweet carrot, $1.50; Cylindra beet, $1.00; Detroit Dark Red beet (organic), $1.50; and Silver Princess Shasta daisy (perennial), $1.00, a short “pretty” that the deer won’t eat. That’s all? Well, yes, that’s all I bought at Wal-Mart. The section was excellent for a big-box store but didn’t have all that I’m looking for. Within the next day or two I’ll finalize my online order from Johnny’s Selected Seeds, and I’ll be pretty much set for seeds for Garden Year 2011. Is there a difference between a packet of veggie seeds bought from the Burpee catalog and a packet bought from a Burpee rack at a local store? Yes, an obvious difference is price. 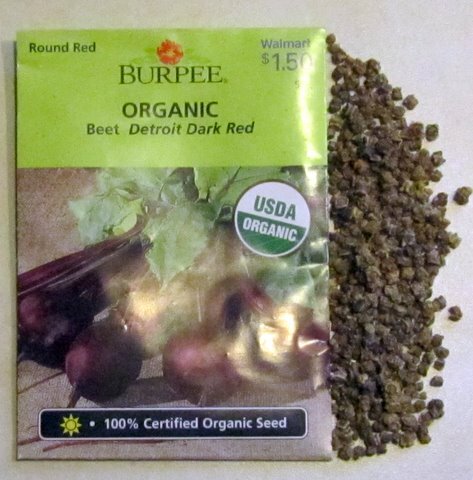 A packet of Detroit Dark Red beet seeds in the Burpee catalog (and online) costs $3.25, while the packet from the Burpee rack at Wal-Mart costs $1.50. Burpee prices seem to vary from store to store. I’ve always suspected another difference is the amount of seeds in the packets. The number of seeds in the Burpee catalog beet packet is 350. The Burpee packet at Wal-Mart says 5g, with no number of seeds indicated. Frugal Bob opened and counted each seed, expecting the number to be significantly less than 350. The number: 469. I admit that I was surprised, pleasantly surprised. I had always assumed there were fewer seeds in the lower-priced packet. Not totally convinced, I went to Burpee online and priced a packet of red Brandywine tomato seeds (organic): $3.95 for 50 seeds. I opened and counted the packet I bought at Wal-Mart, which indicated 150mg. The count: 66 seeds. Ok, I surrender. The lower-priced Burpee packets at Wal-Mart contain just as many seeds, if not more, than their more expensive catalog counterparts. Could Burpee be using inferior seed in the lower-priced packets? 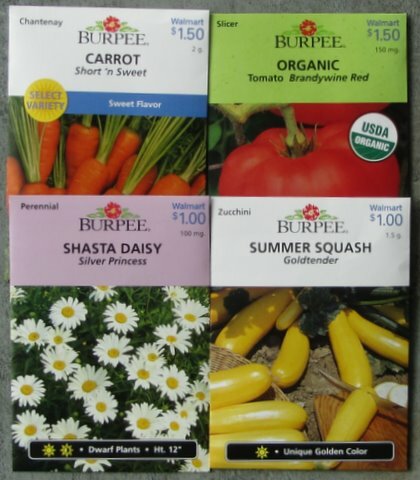 Burpee’s name is both famous and trusted in the world of gardeners, so it would be business suicide, it seems to me, for the company to sell seeds of lesser quality in a packet labeled Burpee. There is another difference I’ve noticed between seed varieties on the racks and those in the catalog. The varieties on the racks seem to be older, better known varieties. The catalog lists many of them too but often features the newest and latest varieties, which may—or may not—be better in some ways than older varieties. I’ll mention one risk in buying all your Burpee seeds at a neighborhood store. You may eventually be dropped from the Burpee catalog mailing list, though I suspect the trend for most seed companies is to wean their buyers from print to Internet catalogs to help keep down costs. Now I’ve got to finalize my order for Johnny’s. It is very nice to see the seed racks in all the stores – even the supermarket now!